July is Juvenile Arthritis Awareness Month and we end this month with a compelling story of juvenile arthritis families helping each other. Cindy Price is co-chair of the Oregon Juvenile Arthritis Task Force, a family-based support group for juvenile arthritis families, the parents and the kids. Her 26-year old daughter was diagnosed at age nine with juvenile idiopathic arthritis (JIA) and it was five long years of trying to understand what this disease was all about before Cindy and six others founded the Task Force. She was instrumental in helping ANRF board member and LPGA professional golfer Kristy McPherson, conduct a “meet and greet” event for JA kids at the Portland LPGA tournament in August, 2014. Eleven years ago, there was no Arthritis Foundation in Oregon to support juvenile arthritis families and the kids suffering with juvenile arthritis. They had left our state due to lack of funding. A woman representing the Arthritis Foundation scheduled a meeting with Dr. Daniel Kingsbury, a pediatric rheumatologist at Randall Children’s Hospital in Portland, on a rainy, cold December night in 2004. I think about six other people, including myself, were in attendance. It was decided that I would start a group for the parents and children with JIA. We named our group the Oregon Juvenile Arthritis Task Force. Dawn Kimball’s husband, who was at the meeting, volunteered his wife to help me. So, that is how we started. The six families we started with have grown to about 175 families today. A flyer with the Task Force contact information is distributed to the doctors to hand out to newly diagnosed patients. Through the years, I have answered countless calls from distraught parents looking for help. I have raced to the hospital to help them, attended countless physician appointments with them, have had them to my house to give counsel, and mainly been a shoulder for them to lean on in difficult times. We used to have quarterly support group meetings, but six years ago, we helped found a camp for the JA children and families in Oregon, which is called Camp JAM, so I now have only one meeting a year. We have educational speakers and entertainment for the children at our meetings and they are always free. All communication with the group is done via email. JA Kids getting a special day with LPGA pro and ANRF Board Member Kristy McPherson. When my daughter, Marian, was diagnosed, we had no one to talk to for the first five years. I remember the feeling of being totally alone, and it has been my goal to make sure no parent ever has to go through what I went through. The doctors freely pass out my phone number to all of the parents. I work hand in hand with the physicians. Our group would not be what it is today without the pediatric rheumatologists at Randall Children’s Hospital. They are beyond fantastic. My daughter is 26 now. Most of the juvenile arthritis families in the Task Force today have never met her. My co-chair, Erika Cox, has heard the stories about Marian, but has never met her. I first spoke with Erika the day her daughter, Charlotte was diagnosed. She called me immediately after diagnosis when Charlotte was not yet two years old. My daughter is probably the sickest child in our group. She is a systemic juvenile rheumatoid arthritis child who has never been in remission. It is usually the parents of the sickest children who are the most passionate. I say usually, but it isn’t always the case. That is my analysis of things after dealing with the disease for the last 16 years and co-chairing a support group for the last 11 years. And the best advice I have ever received about forming a support group was to keep it independent of any foundation or group, so that is what I have done. We at the Arthritis National Research Foundation hope that Cindy Price’s story about helping juvenile arthritis families will inspire other parents in other states to do the same. It takes passion; it provides hope. This year the kids and juvenile arthritis families will have another chance to meet with not only one, but two LPGA professionals. 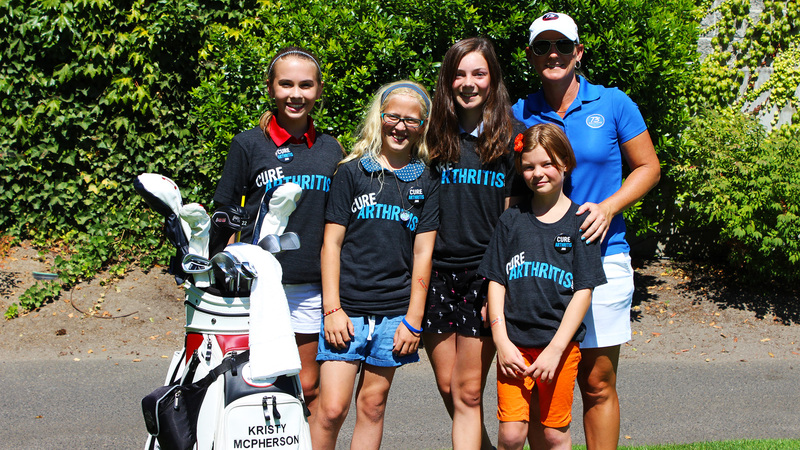 ANRF Board Member, Kristy McPherson and Cure Arthritis Ambassador, Mallory Blackwelder, will be spending the day with JA kids and their families at the 2015 Portland Classic. For more information on this opportunity please contact us as space is limited. Our friends at the Juvenile Arthritis Association might have some resources depending on your area. Send us a contact form submission and we’ll do our best to point you in the right direction for support. I have a 5 year old daughter diagnosed juvenile idiopathic arthritis she’s been taking a naproxen she’s been scheduled at children hospital here in Colorado springs on June 1 2017 to do the steroids injection and to drain the fluid ( joint hip ) I hopefully everything will work out and been praying for her she get better soon…..???? My 14 month old son has been limping for about 6 weeks now. We are seeing pediatric rheumatology on June 1st. I am looking for a support group in the Colorado Springs, CO area. Any ideas? I have a 7 year old that is in desperate need for a jra suppport group. We are having such trouble connecting with anyone that is local and going through similar experiences. Please help us. Hi Lauren, Where are you located? We can try our best to help. Hi everyone. My name is Jessica Abshire and my 11 year old son was just doagonised with JIA and we recently moved from Alaska to Medford Oregon to be closer his doctors. We would love to join this group. What do we need to do? Check with our friends at JuvenileArthritis.org or ArthritisIntrospective.org … They both run support groups.